US President Donald Trump on Wednesday removed Jeff Sessions from the post of attorney-general and struck a combative note against the Democrats, who have warned of using their new majority in the House of Representatives to launch investigations against Trump. Trump announced Sessions had been replaced by Matthew G. Whitaker, who had been Sessions's Chief of Staff at the Justice Department. Whitaker will be acting attorney-general till a permanent replacement is found, Trump tweeted. Meanwhile, Trump warned the Democrats of adopting a “warlike” posture if the Democrats decided to launch investigations of his administration and campaign finances. 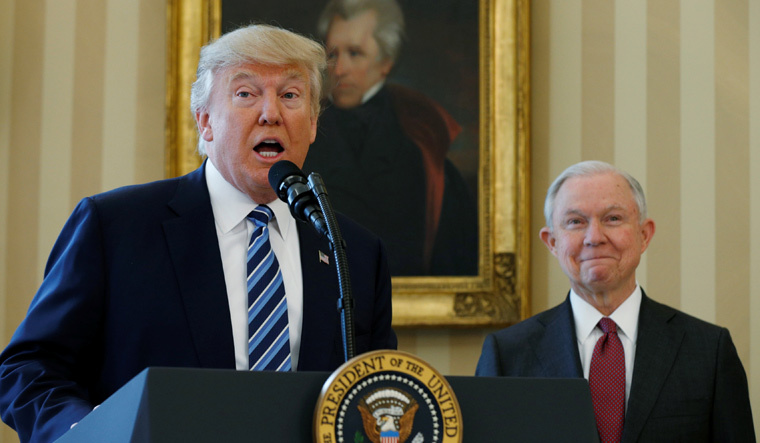 Trump's decision to remove Sessions drew criticism from the Democrats, who alleged it would affect the ongoing probe into Russian interference in the 2016 election. Nancy Pelosi, the House Democrat leader tipped to be the next Speaker, tweeted that the ouster of Sessions by Trump could undermine the Russian meddling probe. Pelosi urged Whitaker to recuse himself from the Russian probe like Sessions had done. Sessions, who had been an ally of Trump, reportedly earned the president's displeasure after he recused himself from the Russia probe. Despite the loss of the Republican majority in the House, Trump boasted about the party's performance in the Senate races, which would help him make key appointments. Trump also announced he was willing to work with the Democrats on key issues, but warned investigations of his administration could derail such bipartisanship. "They can play that game, but we can play it better," Trump said.